We've got an old biscuit celebrating his 55th birthday tonight - along with a belated 45th celebration for another member of the crew. As usual the task of selecting the venue fell on BM's shoulders, and he quickly got us seats at Toritama (酉玉). This Japanese import is famously difficult to book, so we were all (once again) in awe of BM's VVIP status and pull with the best restaurants in town. And I waited patiently for my first visit to what is supposedly the best yakitori (焼き鳥) joint in Hong Kong. Meatball (つくね) - with bits of cartilage. Pretty tasty, but honestly I prefer my つくね in one big, elongated chunk... with bigger pieces of cartilage inside. Calf muscle (とうがらし) - this was incredibly tender, and very, very juicy. Yum. Aorta (心のこり) - nice and soft texture. Liver (レバー) - mmm mmm good. Crown (かんむり) - not something I see on the menu very often, so I asked for it. Very, very nice and tender... and just slightly crunchy. Neck (とっくり) - I was hesitant about this because at battery farms, the neck is where chickens get injected with all the antibiotics and stuff. This turned out pretty tasty, and I found it interesting that mustard was used. I have no idea what this was, but was told it was "potato bean (薯豆)". In reality it wasn't a bean, but the texture and flavors were more like mini potatoes. Japanese green pepper (しし唐) - with bonito shavings on top. Thigh (かしわ) - very tender and juicy. Daylily (金針菜) - these are in season but it was still a surprise to see them being offered here. Thick fried tofu (厚揚げ) - a little bland even with bonito shavings on top. Chicken oysters (ソリレース) - sot-l'y-laisse are among the best parts of a chicken, and these did not disappoint. Very, very tender. Soy sauce ice cream (みたらしアイスクリーム) - I don't have any issues with savory ice cream, so I rather enjoyed this. Remember the Kit Kat with the soy sauce flavor? I liked that, too. Anyway, the flavors of fermented soy sauce were pretty nice, along with what some have called "caramel" notes. Slurp. 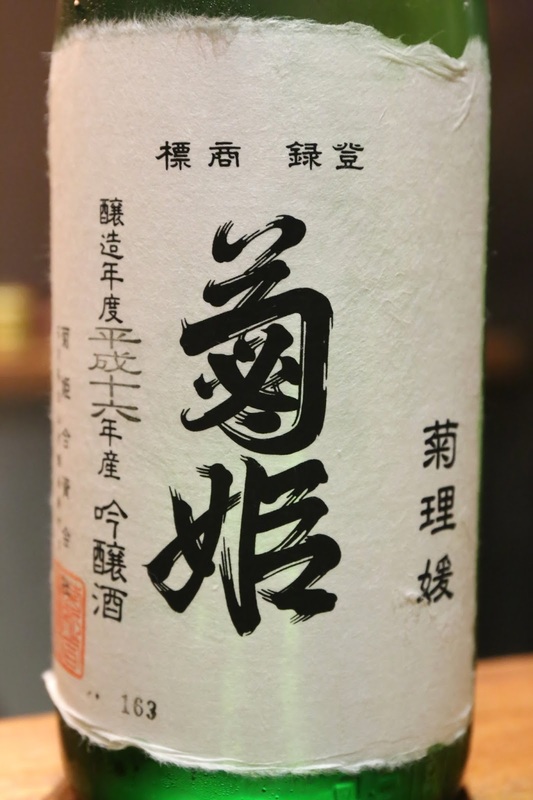 Tonight was the perfect time to bring out an isshobin (一升瓶) of sake, although my request to contribute one of mine was overruled by BM, who very generously brought along a crowd favorite. Kikuhime Kukurihime from isshobin (菊姫 菊理姫 一升瓶), BY26 - very nice on the palate, much rounder and smoother than some of the other bottles I have had, and definitely less dry. A little floral nose with a hint of bananas. We offered some of this delicious sake to Matsumoto-san to thank him for taking care of us. The food tonight really was very, very good... and I'd love to come back again soon.